Welcome to Day #10 of Ecuador Theme Week, and Day #1 of Nibs Theme Week. First, I feel very glad to be living in a world with so much great craft chocolate. 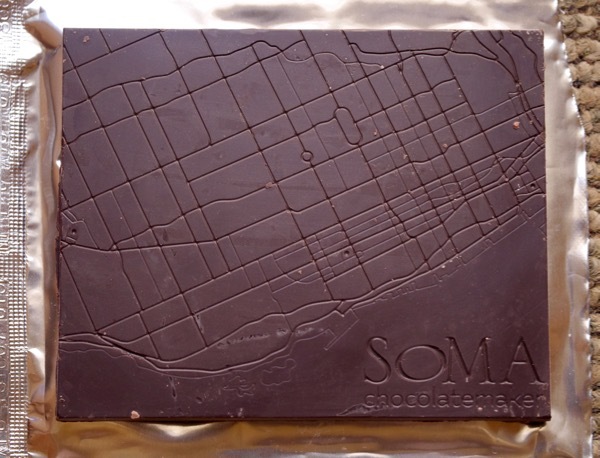 Second, while a trip to Canada would be beautiful this time of year, there's a place right down the street from me where I can buy SOMA and other chocolates from dozens of different places. This still amazes me. 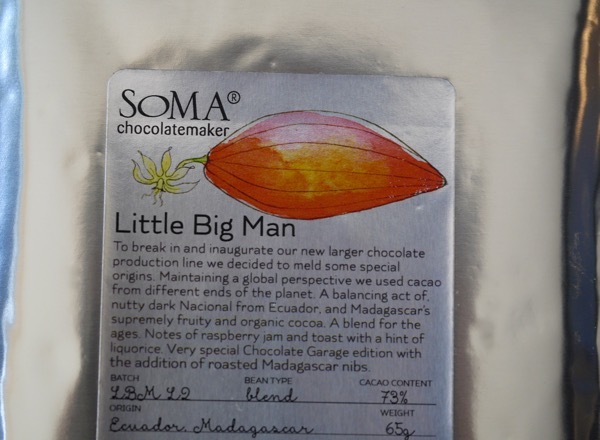 The chocolate makers at SOMA (David, Cynthia and team) have consistently been making creative and high-quality offerings as long as I've been writing about chocolate. Several years ago, I remember parking myself in their shop inside an old, brick whiskey factory, and buying pine-infused and olive oil truffles, and working with a very kind and patient employee at the counter to create a custom sundae, probably with nibs, and finally buying other chocolates that they carried from around the globe. I only left because they were closing. 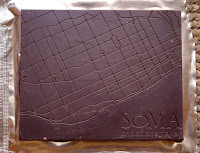 The bar's relatively low sugar content allowed for great cacao aroma and flavor to shine through: earthy, dark and very slightly nutty, with some surprise licorice (liquorice) sparkle. But, wait, we're not done yet. On the other side of the bar was a smattering of cacao (or cocoa) nibs, bits of cocoa bean, that added crunchy texture and another dimension of cacao flavor. *Little Big Man is also the name of a stage play and movie about storytelling.